In a new interview, Disney CEO Bob Iger admits that they made a mistake trying to put out so much Star Wars material in such a short amount of time, and he takes full responsibility. The overload started with Rogue One at the end of 2016 but reached its peak with the release of Solo: A Star Wars Story in May of this year. The spin-off hit theaters less than six months after Rian Johnson's highly divisive The Last Jedi. Solo was doomed at the box office from the start because Star Wars fatigue had already set in. J.J. Abrams is currently in the middle of making Star Wars 9 and a slowdown for the mammoth franchise had already been previously reported back when it was revealed that the spin-off films in development had been put on hold. Obi-Wan Kenobi and Boba Fett movies were ramping up to start production, but the box office failure of Solo put a damper on those plans. Star Wars fans were already weary of Lucasfilm and Disney's partnership cranking out one movie a year, which the studios now recognize was a mistake. Bob Iger had this to say. "I made the timing decision, and as I look back, I think the mistake that I made, I take the blame, was a little too much, too fast. You can expect some slowdown, but that doesn't mean we're not gonna make films. J.J. (Abrams) is busy making (Episode) IX. We have creative entities, including (Game of Thrones creators David) Benioff and (D.B.) Weiss, who are developing Star Wars sagas of their own, which we haven't been specific about. And we are just at the point where we're gonna start making decisions about what comes next after J.J.'s. But I think we're gonna be a little bit more careful about volume and timing. And the buck stops here on that." Bob Iger's remarks about the Star Wars franchise are the first official comments that have come out about the future. While new projects will be coming out, Disney and Lucasfilm are going to pump the brakes for the time being. 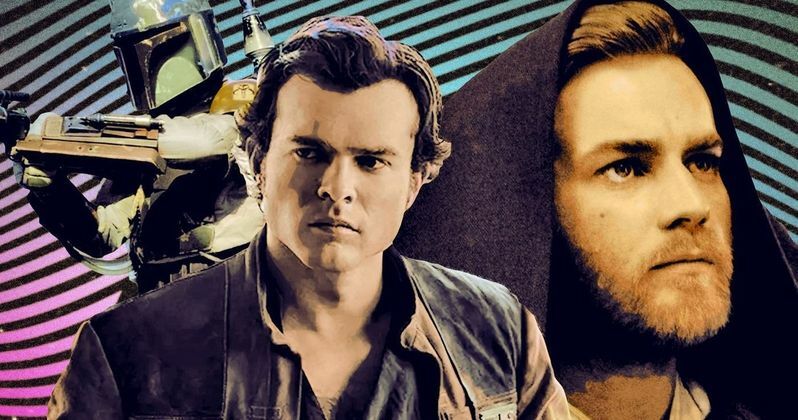 Alden Ehrenreich originally signed a three-film contract for a trilogy of Solo films and there were whispers of a Lando spin-off as well, but it appears that those aren't going to be happening any time soon, if at all. In addition to the big screen side of things, the animated Star Wars Resistance series is on the way, as well as Jon Favreau's live-action series. While taking a look at the Star Wars aspect of things, Disney may want to take the same approach when it comes to their Marvel Studios productions as well. Disney's new streaming service has just ordered some new Marvel Cinematic Universe shows for the platform, which could very well send the MCU into the Star Wars territory of fatigue. It's inevitable that a certain group of Star Wars fans will notice that Bob Iger did not specifically bring up Rian Johnson's new trilogy that he is currently writing. The director confirmed that he is still in the process of putting the story together, despite rumors that his trilogy had been canceled. However, that doesn't mean that Johnson's saga could be delayed for the time being. We'll just have to wait and see. In the meantime, you can read the rest of the interview with Bob Iger at The Hollywood Reporter.